We offer the finest quality Optical Interference Filters in the market. Colored glass filters are optical components that control incident wavelength by distribution. Thus more than 60 different Infrared Optical Filters materials are at your continuous disposal. In the following, you will find the principle transmission curves of all optical glass filter materials. They are available in a wide range of colors and specifications. 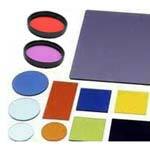 In addition to this, we are one of the most credible Optical Filters Exporters in India.